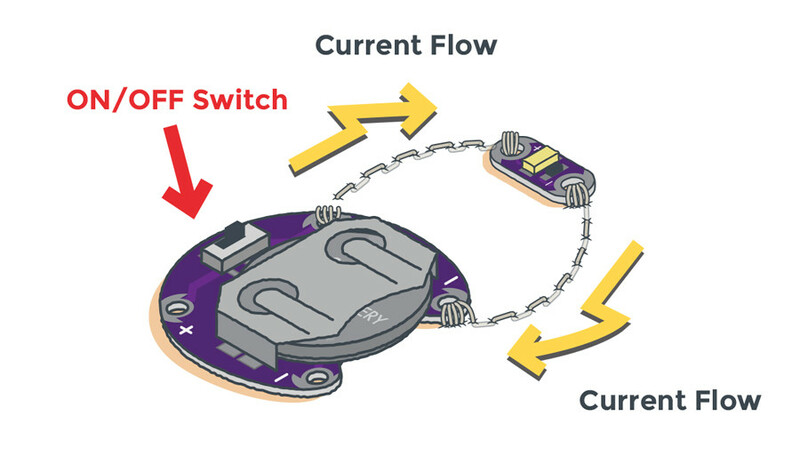 If you are new to circuits as a concept, you may want to have a look at some of the tutorials below before continuing. The LilyPad system was designed by Leah Buechley while pursuing her Ph.D. in computer science at the University of Colorado Boulder. The commercial version of the kit, which launched in 2007, was collaboratively designed by Leah and SparkFun Electronics. You can learn more about LilyPad at SparkFun.com/LilyPad. 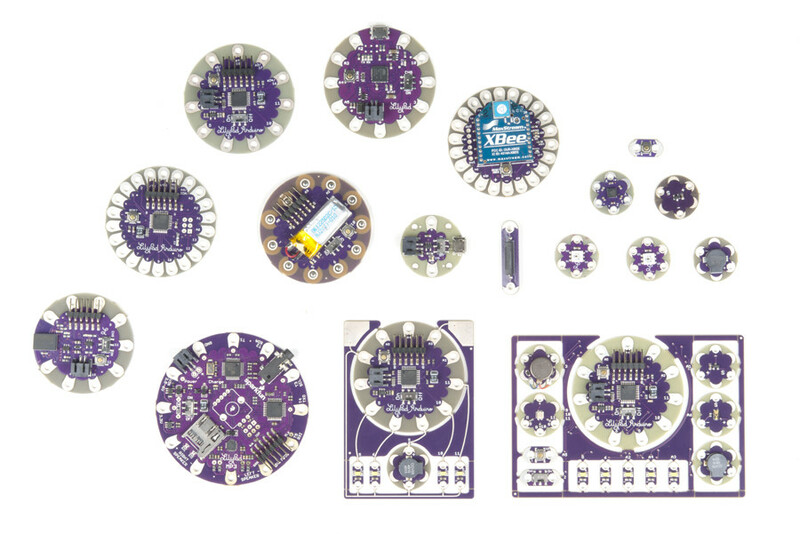 Some LilyPad pieces come in a ProtoSnap configuration, which means all of the individual components – such as LEDs, battery holder, switches, buttons, etc. 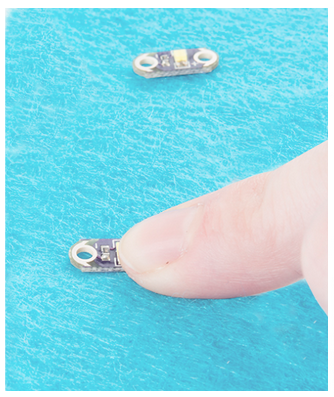 – are attached to one another in a single functioning circuit board. 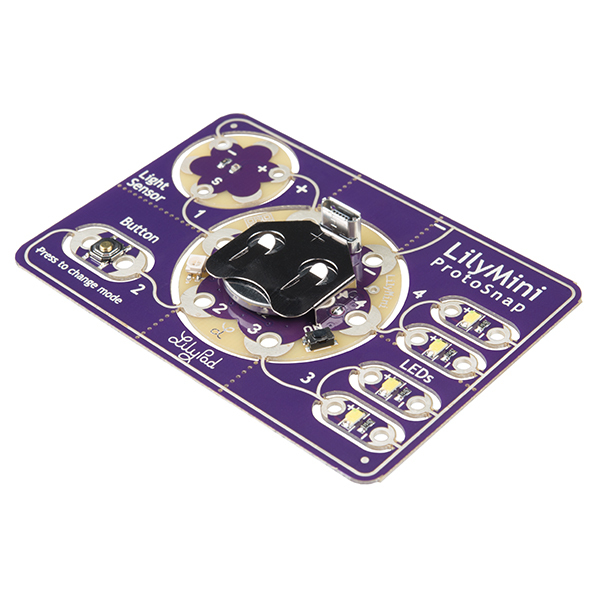 This allows you to easily program your circuit to do what you want before embedding it in your project. ProtoSnap boards are designed to be easily snapped apart into individual pieces when you’re ready to begin creating LilyPad projects. 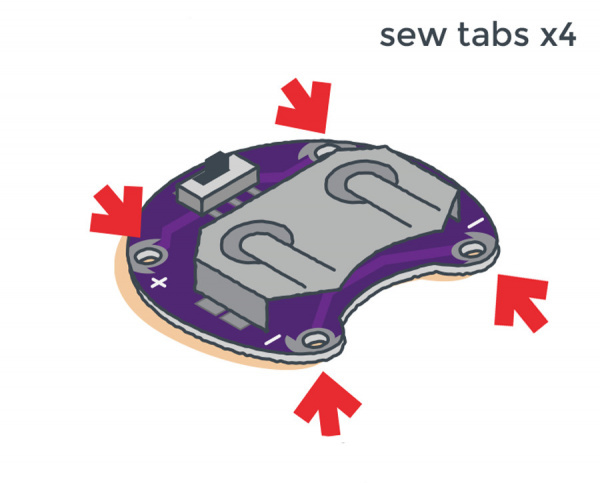 This is slightly different than LilyPad products that come in a panel configuration. 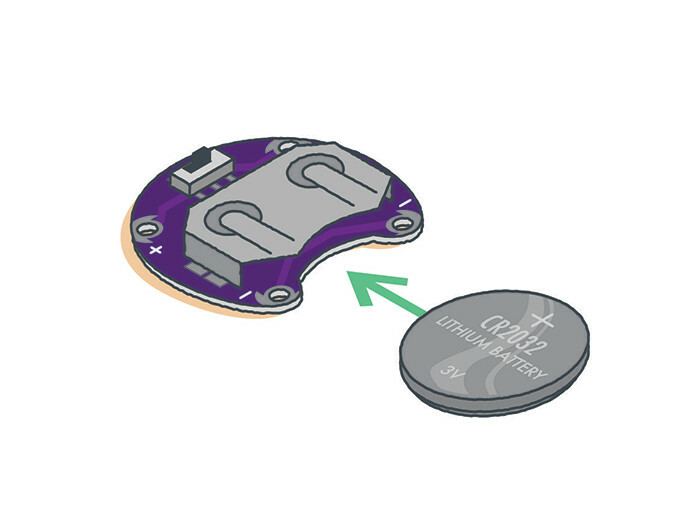 The LilyPad LEDs are attached together, but not in a functional circuit. You will need to snap them apart before sewing into a circuit. If you are using a LilyPad kit such as the LilyPad Sewable Electronics Kit, you will have a conductive thread bobbin available to use. 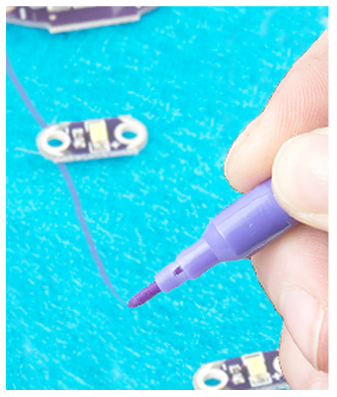 To help plan where the stitches will go, you can use a marker to draw lines between the components. 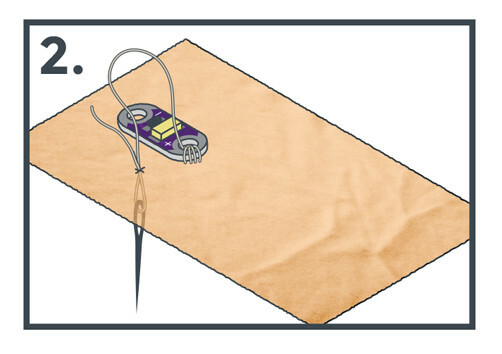 Cut a piece of conductive thread approximately 2 feet long. 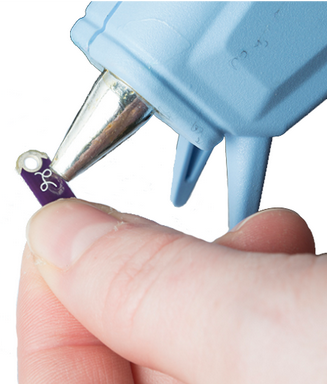 Push one end of the thread through the eye (opening) of the needle and pull through, leaving a tail of about 5 inches. Before you begin sewing your project, you will need to tie a knot at the long end of the thread to prevent you from completely pulling it through the fabric. 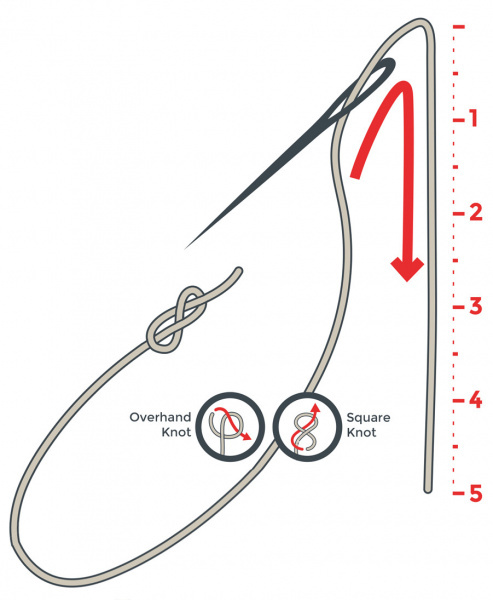 You can tie a simple overhand or square knot. The next sections will explain a few other knot methods. 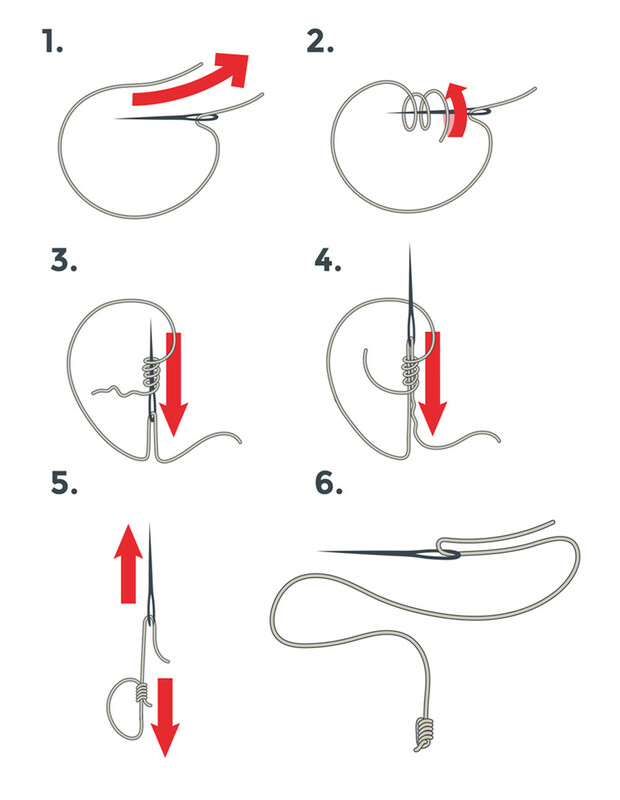 A starter knot is a method of starting your stitch with a knot directly on your fabric. 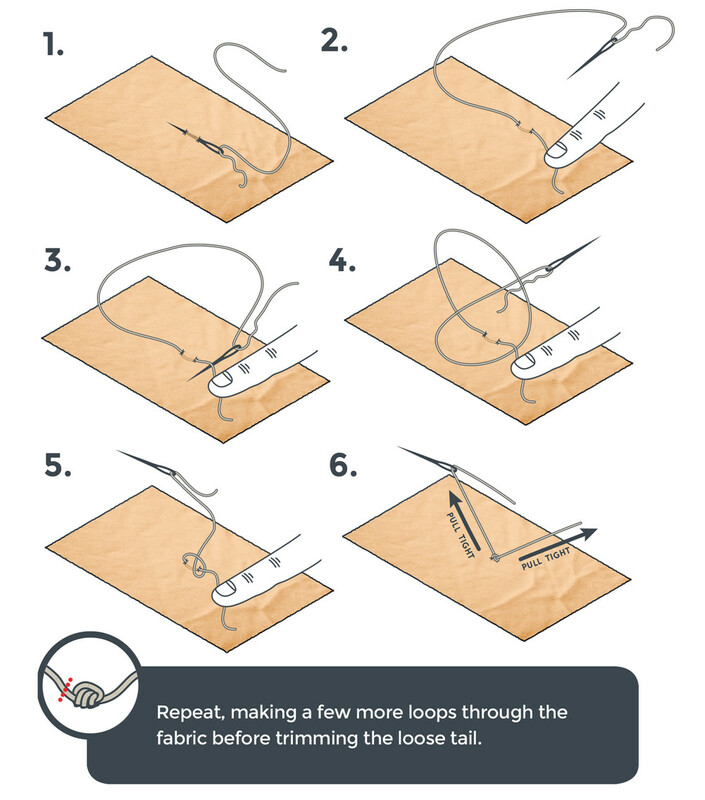 The slightly more advanced quilter’s knot is a way to tie a quick, secure knot on the thread. 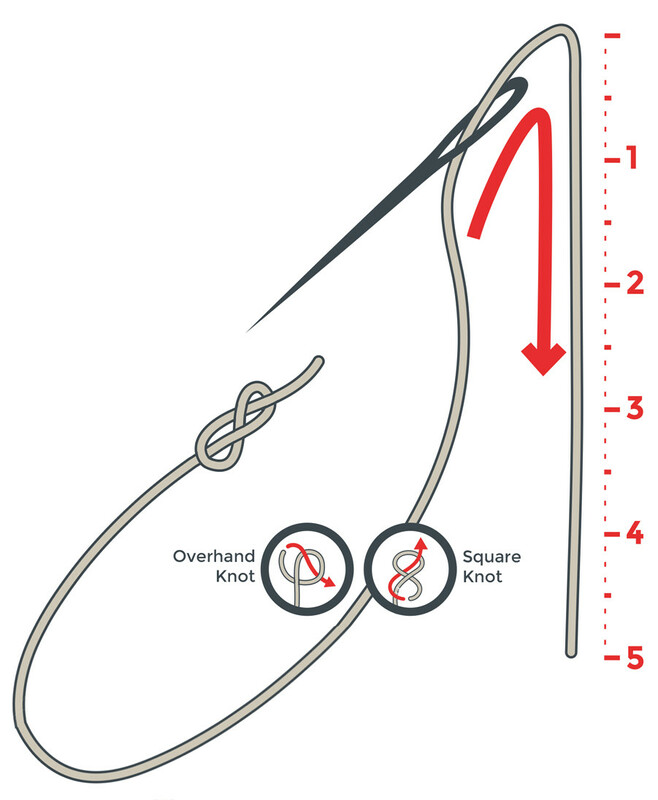 After some practice, this knot can be tied very quickly. 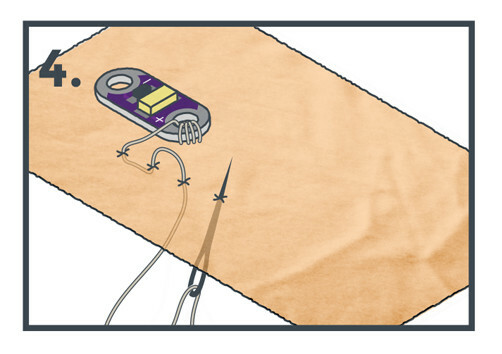 Push the needle through the fabric about ¼" in the direction of your stitch path. 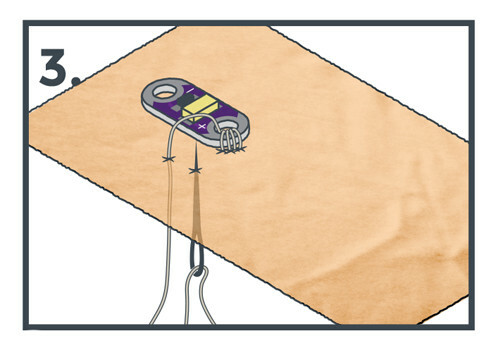 Pull the slack of the thread through so it sits flush with the fabric. Push the needle back up through the fabric another ¼" along the stitch path. 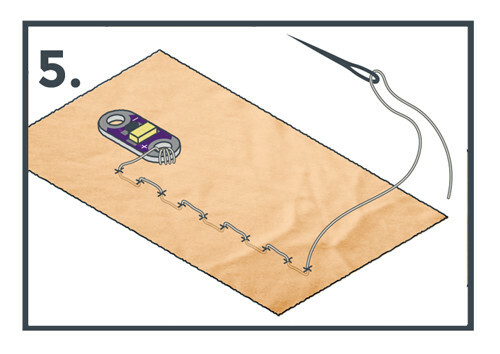 Repeat this process to travel along the path to the next LilyPad piece you want to connect to, keeping stitches evenly spaced. 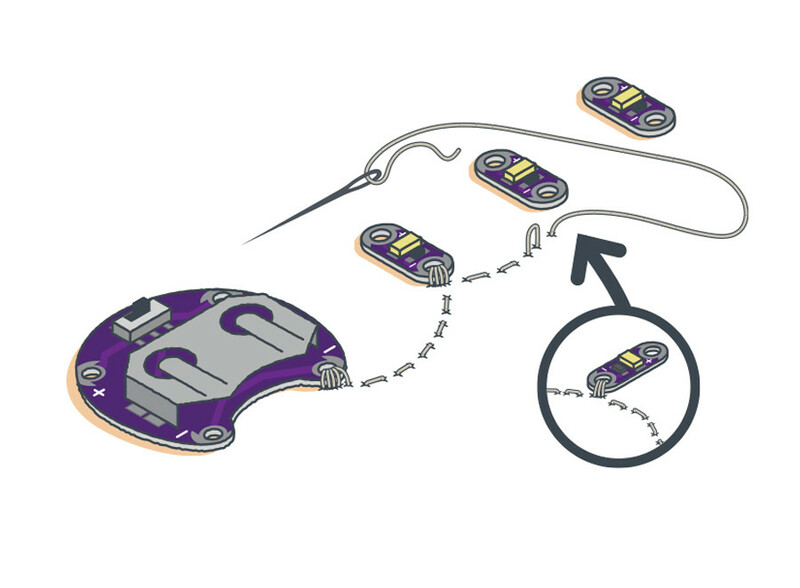 Both running and hidden stitches will enable you to connect LilyPad components together with a single length of conductive thread. 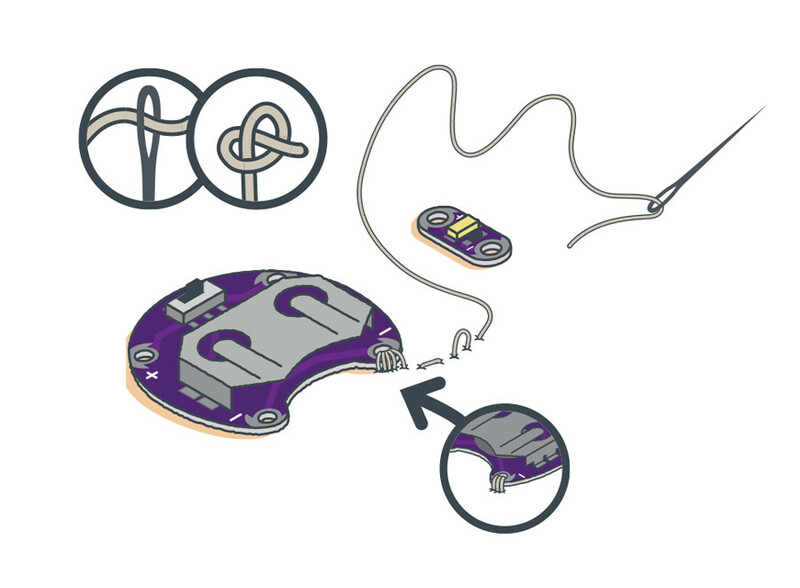 To connect two LilyPad pieces, continue stitching after completing three to four loops around the sew tab. 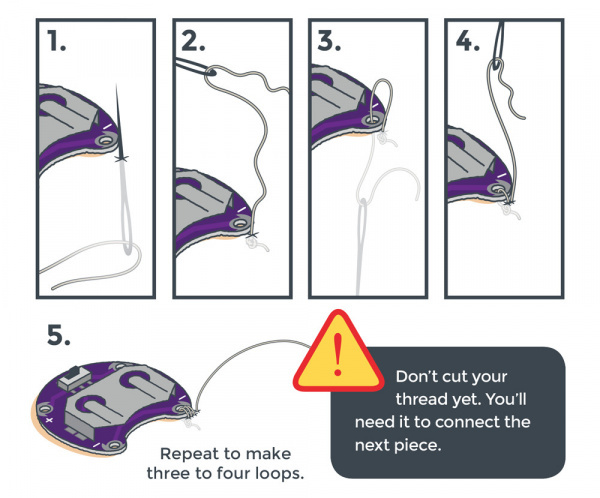 To connect more than two LilyPad pieces, instead of trimming your thread and starting over, continue stitching to the next piece, make three to four loops, and repeat as necessary. 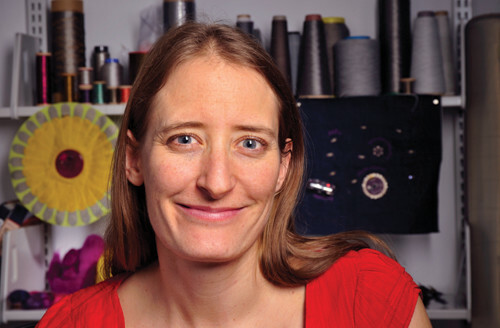 There is no need to use a new length of thread if the pieces will share a connection. 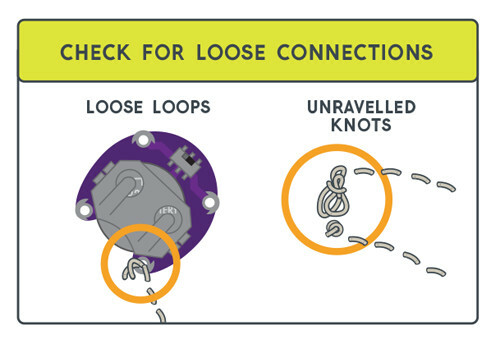 When you have completed connecting components, use a finishing knot. 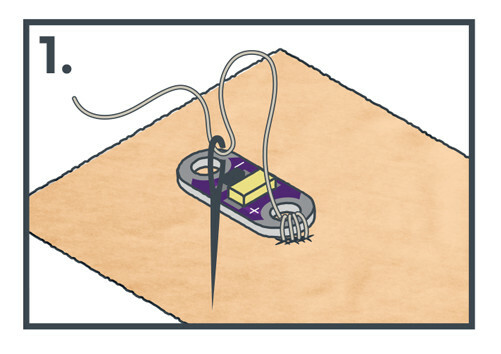 Thread tails can cause electrical shorts, so be sure to trim your thread afterward. 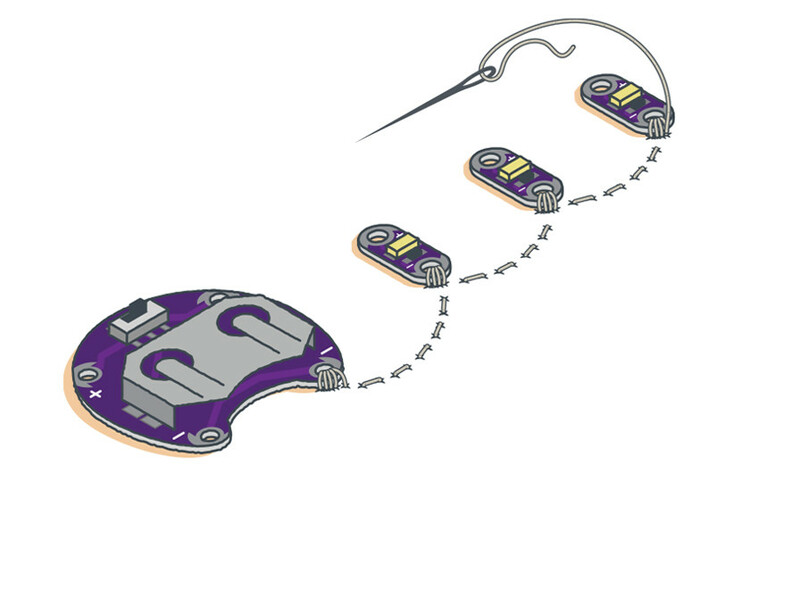 Or continue on to Glowing Pin of the LilyPad Sewable Electronics Kit to build your own circuit. 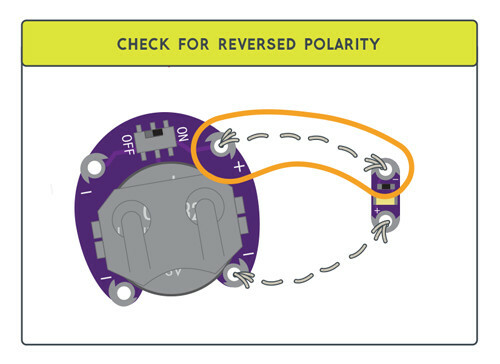 If you are still having trouble, you can use a multimeter to check for continuity or issues with your circuit. 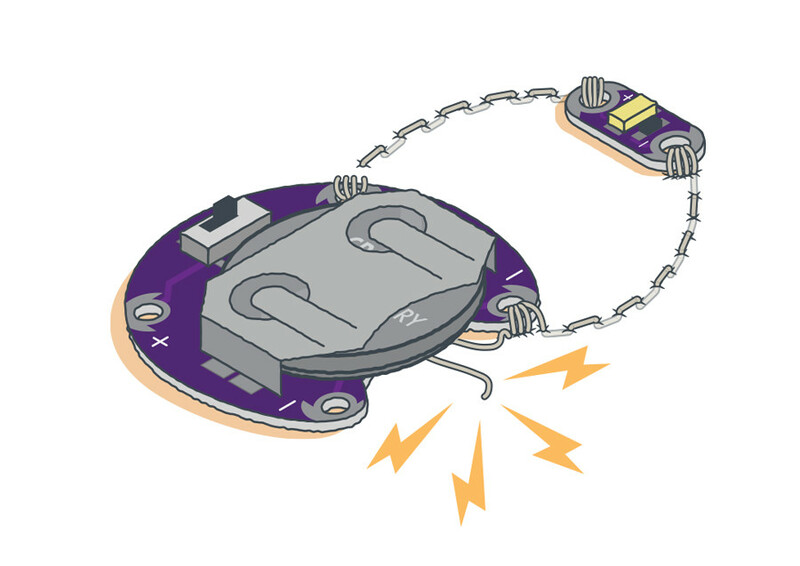 Our How To Use a Multimeter tutorial will help you get started. 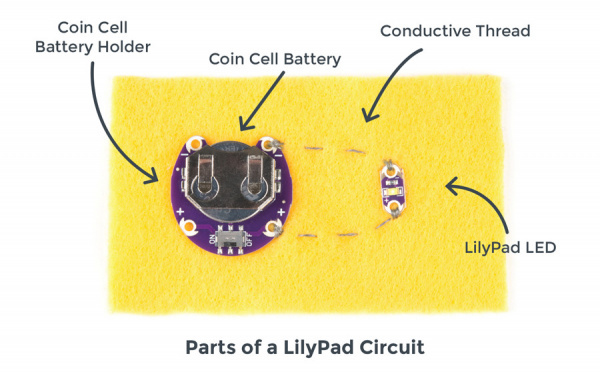 Click here to view a pdf of Troubleshooting pages from the LilyPad Sewable Electronics Kit. 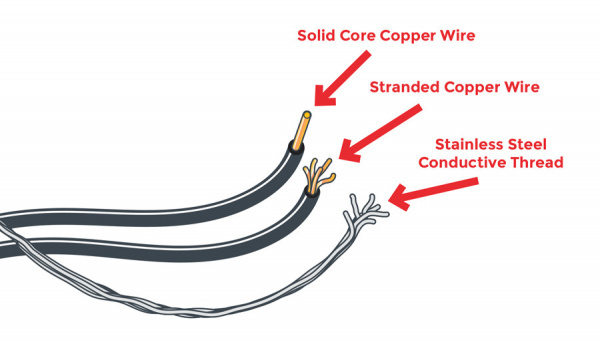 Unlike copper wire, which has a coating, conductive thread is uninsulated. 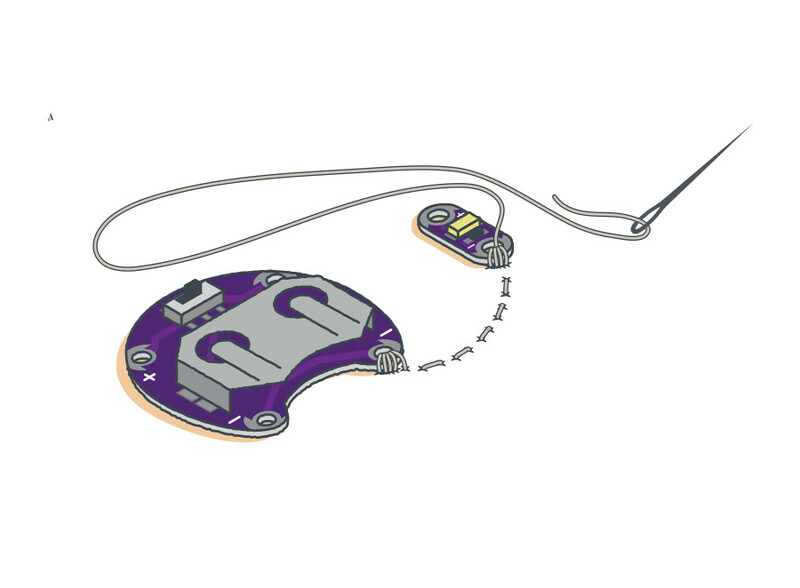 This means the thread behaves like bare wire and can accidentally short circuit if stray strands come in contact with each other. If your project gets dirty, remove the battery and carefully hand wash with mild detergent. 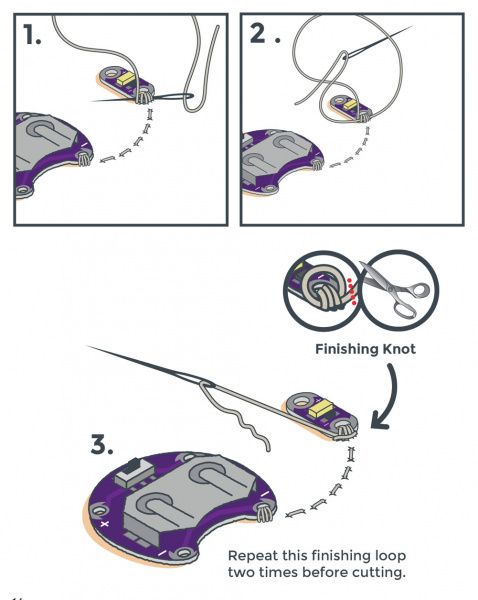 Let your project air dry; a dryer can damage the LilyPad pieces or stitching.